The cold weather is hear, and that means soup season is here!! 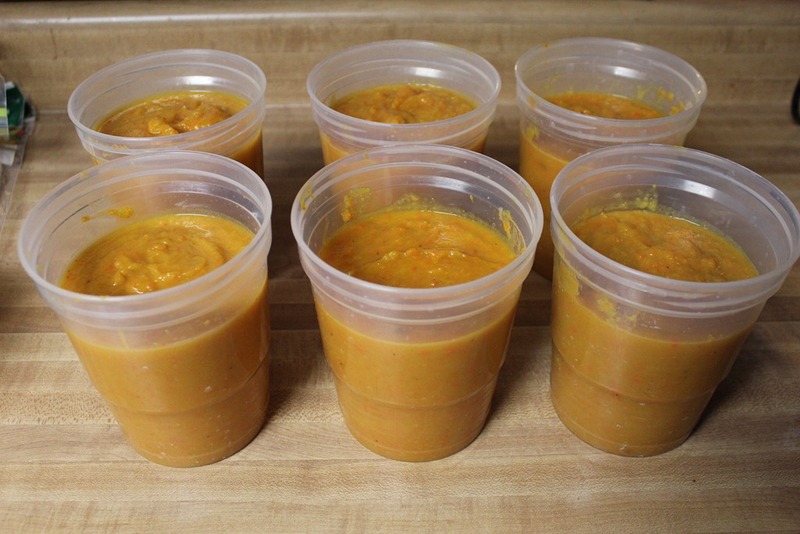 I have spent quite a bit of time lately making large batches of different soups for our freezer, and this Roasted Butternut Squash and Carrot Soup is one of them. As you can see I’ve been making a few batches of it to freeze in my plastic freezer Ball jars! Plus, look at what I found at the grocery store this year! 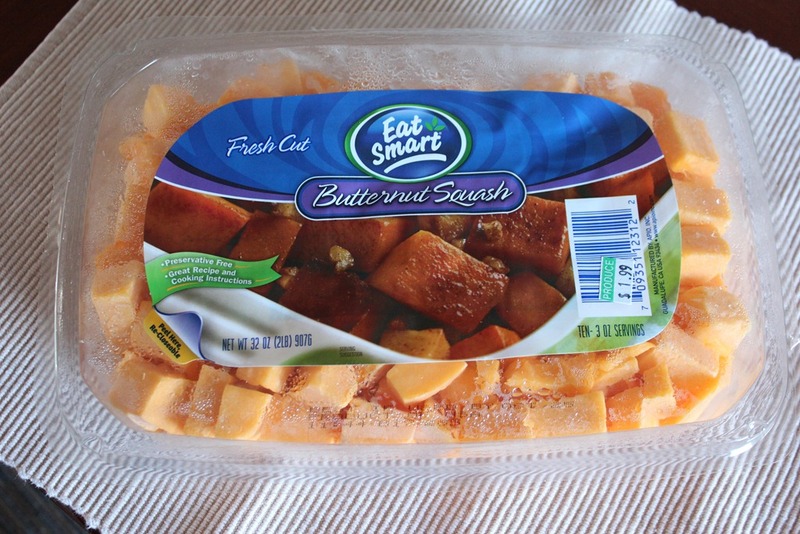 Precut butternut squash for only $1.99 a package!!! Wooohooo! Last year I cut my middle finger right down to the bone while peeling a butternut squash (yes I was totally mature when showing people my finger ), and I was quite worried about peeling one again this year. Now I don’t have to . If you don’t have access to precut squash, then I do have a tip for you. My friend Christy, who is a total genius, taught me how to make peeling squash easier! All you do is cut the top off of your butternut squash and throw that baby in the microwave. Then, microwave it for a few minutes until the squash becomes a bit easier to work with…i.e. peel. Pretty neat huh! Thank you Christy!! This hearty soup is a huge favorite in our house and will warm you up on those cold winter days! Preheat oven to 400 degrees. 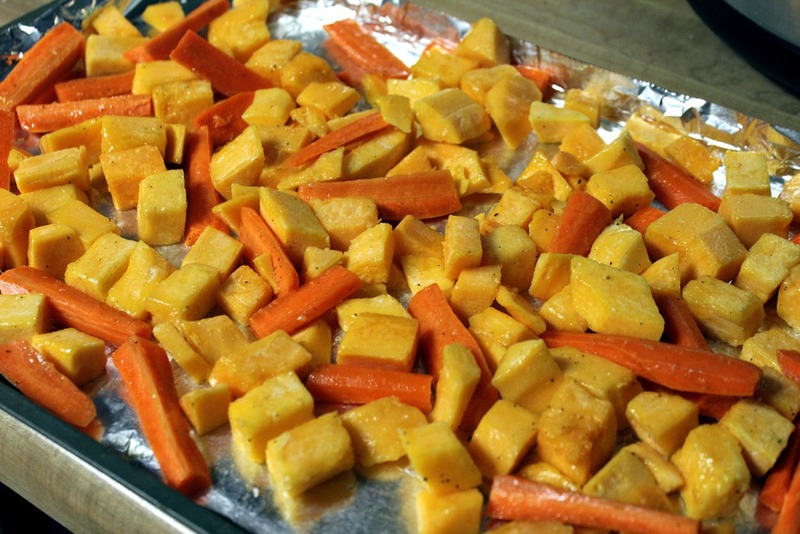 Place the cut squash and carrots on a baking sheet lined with aluminum foil (this will make your clean up easier, trust me). Drizzle with extra virgin olive oil, and sprinkle with salt and pepper. I then use my hands to make sure all the veggies are coated with the oil, salt, and pepper. Roast in a 400 degree oven for 40-50 minutes, or until soft. While the carrots and squash are in the oven. Heat a large pot over medium low heat add olive oil. Then, add the sliced apple and onion. 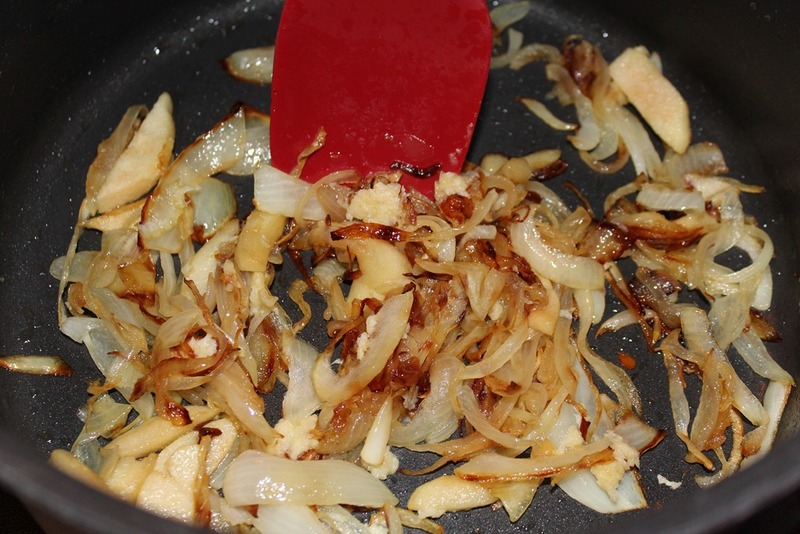 Cook the onions until caramelized. Then add minced garlic, stir, and cook for about a minute. 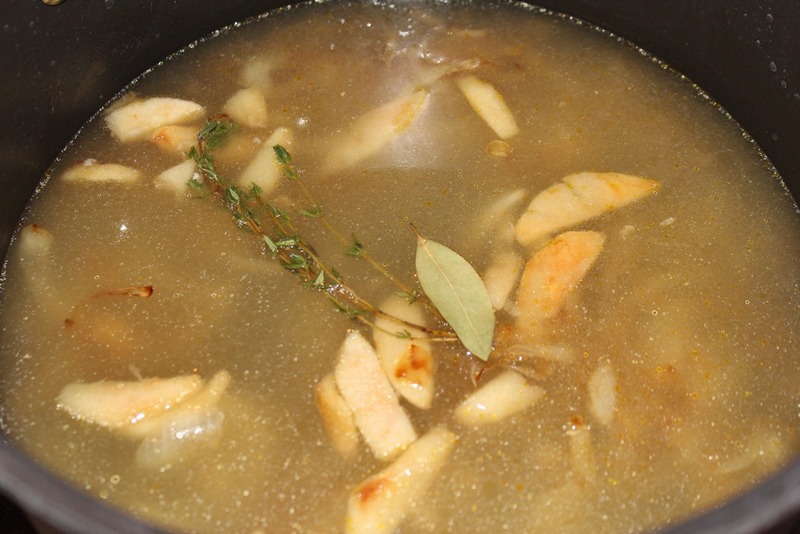 Once caramelized, add the quart of chicken broth, sprigs of thyme, and bay leaf. Bring to a boil. Then, reduce heat to simmer for 10-15 minutes. Remove from heat and discard the thyme sprigs and bay leaf. When the squash and carrots are finished, remove them from the oven and place on a cooling rack. 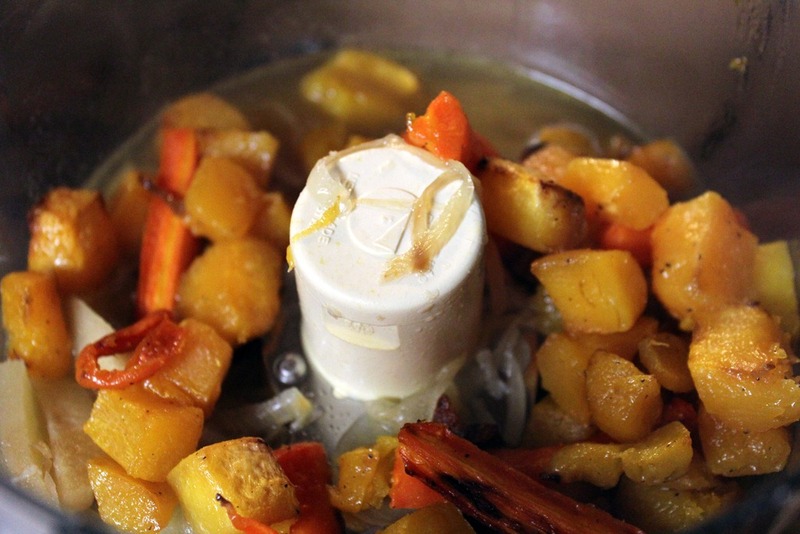 In batches, puree the roasted veggies and apple-stock in a food processor. Serve and Enjoy!!! Preheat oven to 400 degrees. 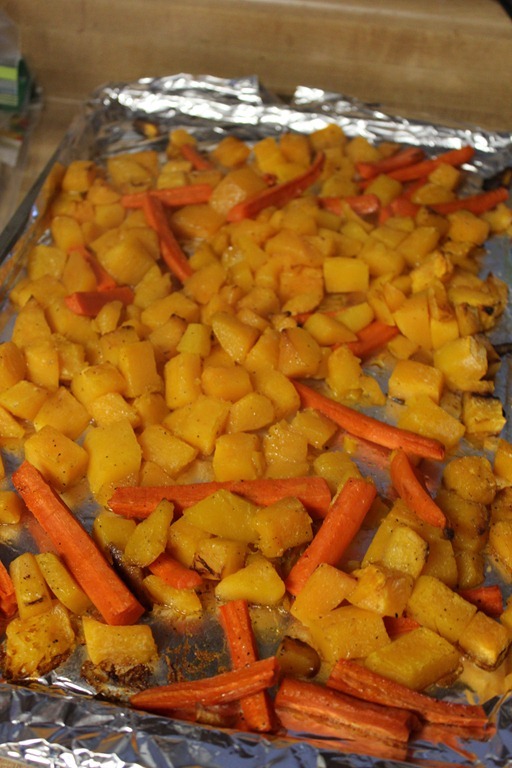 Place the cut squash and carrots on a baking sheet lined with aluminum foil (this will make your clean up easier, trust me). Drizzle with extra virgin olive oil, and sprinkle with salt and pepper. I then use my hands to make sure all the veggies are coated with the oil, salt, and pepper. Roast in a 400 degree oven for 40-50 minutes, or until soft. While the carrots and squash are in the oven. Heat a large pot over medium low heat add olive oil. Add the sliced apple and onion. Cook the onions until caramelized. Then add minced garlic, stir, and cook for about a minute. Once caramelized, add the quart of chicken broth, sprigs of thyme, and bay leaf. Bring to a boil. Then, reduce heat to simmer for 10-15 minutes. Remove from heat and discard the thyme sprigs and bay leaf. When the squash and carrots are finished, remove them from the oven and place on a cooling rack. In batches, puree the roasted veggies and apple-stock in a food processor. This soup is perfect for freezing or serving up the same day!! Enjoy!! 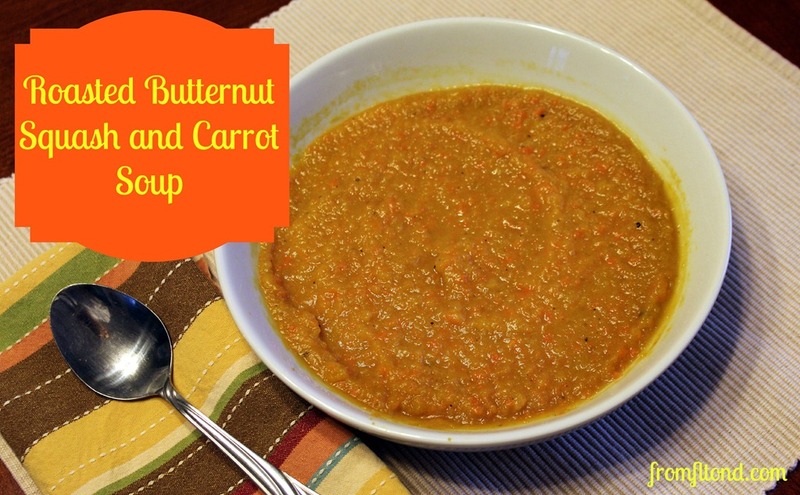 This entry was posted in Recipes, Soups and tagged butternut squash and carrot soup, butternut squash soup, healthy, recipe, soup recipe on November 9, 2012 by fromfltond. Mmmm..this looks absolutely delightful. I love soup this time of year. I think I may try this very soon! You should!! It will fill you up and warm you up!